Brian Mohr and Emily Johnson have awesome jobs. As professional photographers specializing in outdoor adventure, there's a thin line separating work from play. The mountains are their office. Their business attire, Gore-Tex. And their job satisfaction, infectiously radiant. Their Vermont-based company is called Ember Photograpahy. The two have been shooting together professionally for over ten years. In that time they've learned to embrace Mother Nature's many moods, realizing that not all days can be well lit with bluebird skies above. Yet despite the sometimes fledging conditions, they layer up and skin in to remote stashes throughout Vermont—frequently in [R429R, Stowe], Mt. Mansfield State forest and the Mad River Valley—to ski whatever they can find and love every moment of it. Photo by Brian Mohr/Ember Photography. Along with shooting for an impressive portfolio of clients, the pair host on-going public exhibits of their work throughout New England. 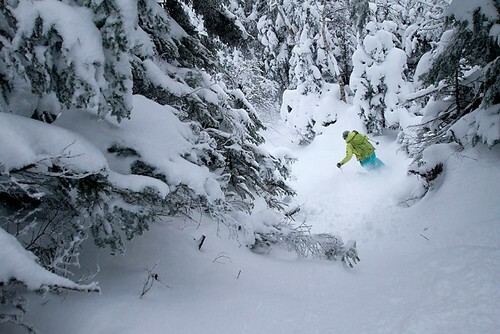 The latest, Off Piste in the Northeast is an ever-evolving, multi-media slideshow (photos and video) featuring skiing adventures throughout the northeast US/Canada. Learn about Mohr's shooting process, philosophy and current slideshow in his interview with OnTheSnow. OnTheSnow: For the geeks... what's your go-to setup (cam, lenses, filters, etc.)? Brian Mohr: We most commonly shoot with Canon 5Ds coupled with Canon 17-40mm, 24-70mm and 70-200mm lenses. We prefer natural light as a filter, but occasionally, we use a set of Singh Ray graduated filters for high contrast landscapes... and even more rarely, we'll pull out a polarizer. We've nearly always got a fresh UV filter over our lens, too, which doubles as a crucial lens protector. OTS: What's your shooting mantra? BM: Keep moving. Pack plenty of battery power. Love it. Sunset along the Long Trail in Vermont. Photo by Brian Mohr/Ember Photography. OTS: What's your favorite location to shoot? BM: Green Mountains, Vermont, for its incredible diversity of light and weather. OTS: In your opinion, what's the most creative angle or best shot composition? BM: It's great to celebrate the terrain and landscape by framing the skier with elements of the scene. You see so many skiing images that could have been captured nearly anywhere. 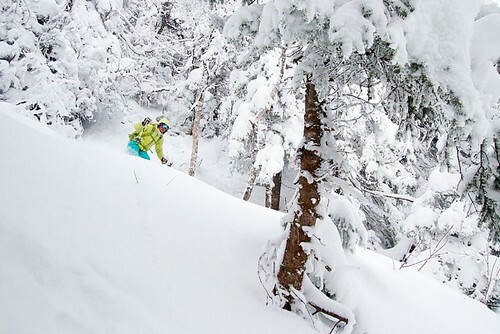 It's key to put the skier somewhere unique, and then allow the viewer to be right there with them. Even within that composition, the options are endless, but we really like to get well below the skier and show where the skier is coming from... or somehow get above the skier and show where the skier is going. OTS: Do you shoot on film ever? BM: We haven't shot on film since 2006. The advantages of shooting digital are now countless. 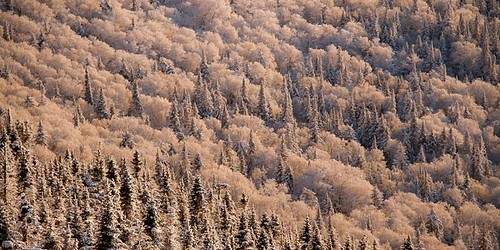 Alpen glow on the forest canopy in early January. Photo by Brian Mohr/Ember Photography. OTS: How do you keep your gear from icing and fogging out of control during shoots? BM: Diligence. On very snowy or wet days, we are regularly wiping the camera and lenses of stray snowflakes and moisture. The camera travels in our protective chest packs, and, on snow or rain days, gets zipped under the hooded shells we are wearing. We avoid overheating our bodies, or unnecessarily bringing the cameras into a warm environment, which can lead to condensation challenges. When we do pull a camera out to shoot, we're extra careful to keep the pointed away from the driving snow and precip, under the shelter of our jacket's hood and we're quick. OTS: Ever trashed your gear on the hill? Backstory, please. BM: Just once... knock, knock... while climbing over a log, with the camera in one hand, just one hour into a three day tour of Vermont's Glastenbury Wilderness. I nearly threw the camera at the log, which cracked the UV filter, dented its frame and made it nearly impossible to remove it from the lens in the field. We had to surgically remove the glass in the damaged filter in order to have a clear shot through the lens. Lake Champlain, still unfrozen and fueling the Champlain Powder machine. Photo by Brian Mohr/Ember Photography. OTS: What do you want people to take from the 'Off-Piste' slideshows? BM: The idea that any day of skiing is a great day of skiing... and that no matter what the snow conditions, skiing is always fun. WHEN: Thursday, Jan. 19, 7 p.m. WHEN: Thursday, Feb. 2, 7 p.m. WHEN: Sunday, Feb. 19, 7 p.m.